The capsule collection from Sacai's Chitose Abe sports some serious femme flair, without sacrificing the company’s "just do it" functionality. Nike may have started out as a mere running brand 51 years ago, but thanks to collaborations with such high-fashion designers as Riccardo Tisci, Johanna Schneider, and Errolson Hugh, it seems the athletic brand has its sights on a more fashion-forward vision. 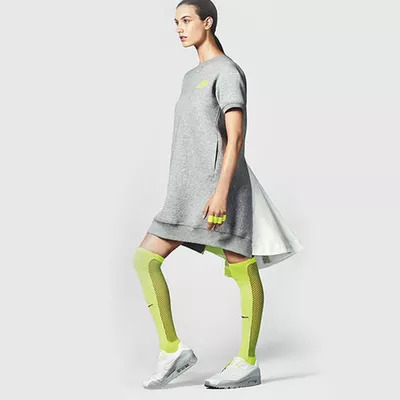 And the NikeLab x sacai spring 2015 collaboration is further proof of this. At the helm of the collaboration is Chitose Abe, who was charged with re-imagining beloved Nike staples such as sweat pants, hoodies, and socks. And she does just that, as the 8-piece collection sports some serious femme flair, without sacrificing the company’s "just do it" functionality. A bold expression of Abe’s edgy style, her silhouettes feature poppy colors and fluid fabrics that celebrate unhampered movement. 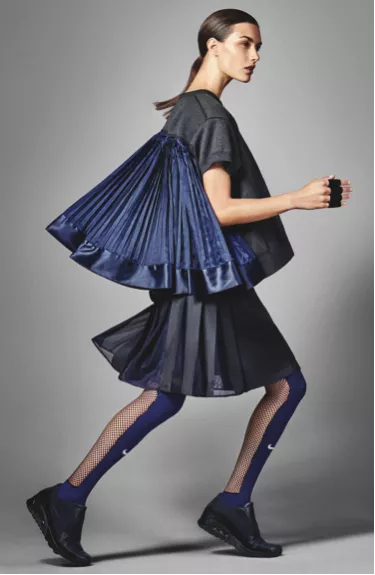 There’s a skirt with green pleating shooting from the back, a hoodie with a rear peplum, socks with fishnet detailing along the back and more—proving that the future of fitness apparel is looking pretty bright. And what Nike collection would be complete without a pair of cool kicks? The Japanese designer’s version is a reincarnation of the Air Max 90 in a stylish slip-on, and it's a thing of beauty. We’ve picked out a few of our favorite pieces that are sure to up your cool points, whether you’re milling (or, in this case, swooshing) about town or on the treadmill.